Acetaminophen (also known as APAP) is a medication that is commonly present in fever, flu, cold-relievers, as well as in painkillers. Acetaminophen Overdose is the excessive intake of one or more medications with acetaminophen, intentionally or by accident. It is commonly known as Tylenol (in US) or paracetamol (in other parts of the world), and is also present in a number of medications such as Anacin-3, Panadol, Percocet, Tempra, Nyquil-Dayquil, Sudafed, Liquiprin, and other cold medications. What are the Causes of Acetaminophen Overdose? Intentional overdose due to depression, suicidal feelings, etc. The intake could be accidental, or in some cases intentional, to bring self-harm. What are the Signs and Symptoms of Acetaminophen Overdose? 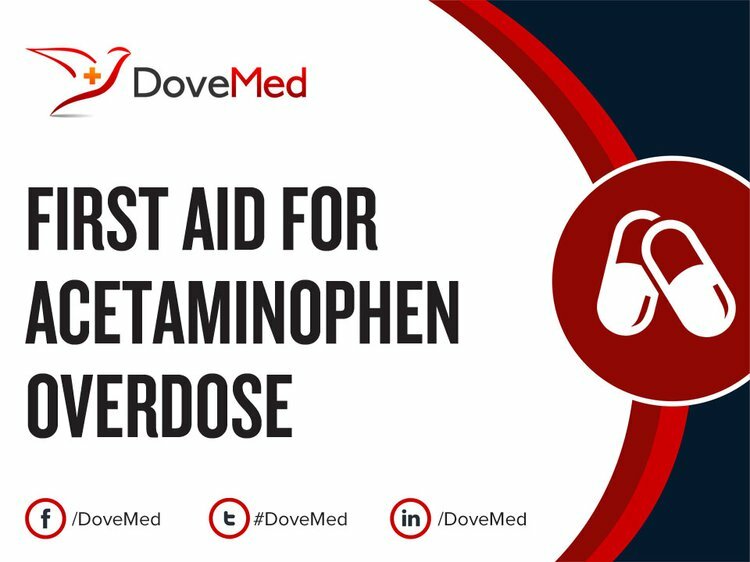 How is First Aid administered for Acetaminophen Overdose? Provide the healthcare provider with any available and relevant information about other medications taken by the patient and information on his/her general health. Who should administer First Aid for Acetaminophen Overdose? The individual affected by Acetaminophen Overdose, or someone in close proximity to the individual, should seek immediate assistance from the Poison Control Center and get patient to the emergency room. First Aid is generally administered by healthcare workers at the emergency room. What is the Prognosis of Acetaminophen Overdose? The prognosis of Acetaminophen Overdose is dependent on the dosage of acetaminophen, time from overdose to start of treatment, severity of the symptoms, general health and liver function of the patient. How can Acetaminophen Overdose be Prevented? Hornsby, L. B., Whitley, H. P., Hester, E. K., Melissa, T., & Donaldson, A. (2010). Survey of patient knowledge related to acetaminophen recognition, dosing, and toxicity. Journal of the American Pharmacists Association, 50(4), 485-489. Heard, K. J., Green, J. L., James, L. P., Judge, B. S., Zolot, L., Rhyee, S., & Dart, R. C. (2011). Acetaminophen-cysteine adducts during therapeutic dosing and following overdose. BMC gastroenterology, 11(1), 20. Blieden, M., Paramore, L. C., Shah, D., & Ben-Joseph, R. (2014). A perspective on the epidemiology of acetaminophen exposure and toxicity in the United States. Expert review of clinical pharmacology, 7(3), 341-348. Fouad, A. A., & Jresat, I. (2012). Hepatoprotective effect of coenzyme Q10 in rats with acetaminophen toxicity. Environmental toxicology and pharmacology, 33(2), 158-167. Heard, K. (2010). A multicenter comparison of the safety of oral versus intravenous acetylcysteine for treatment of acetaminophen overdose. Clinical Toxicology, 48(5), 424-430. McGill, M. R., Li, F., Sharpe, M. R., Williams, C. D., Curry, S. C., Ma, X., & Jaeschke, H. (2014). Circulating acylcarnitines as biomarkers of mitochondrial dysfunction after acetaminophen overdose in mice and humans. Archives of toxicology, 88(2), 391-401. Green, T. J., Sivilotti, M. L., Langmann, C., Yarema, M., Juurlink, D., Burns, M. J., & Johnson, D. W. (2010). When do the aminotransferases rise after acute acetaminophen overdose?. Clinical toxicology, 48(8), 787-792. McGill, M. R., Staggs, V. S., Sharpe, M. R., Lee, W. M., & Jaeschke, H. (2014). Serum mitochondrial biomarkers and damage‐associated molecular patterns are higher in acetaminophen overdose patients with poor outcome. Hepatology, 60(4), 1336-1345.